NETWORK FINALS: The NBA PLAYOFFS game on ABC adjusted to 1.9, and the NHL PLAYOFFS game on NBC went to 1.3 in final numbers. 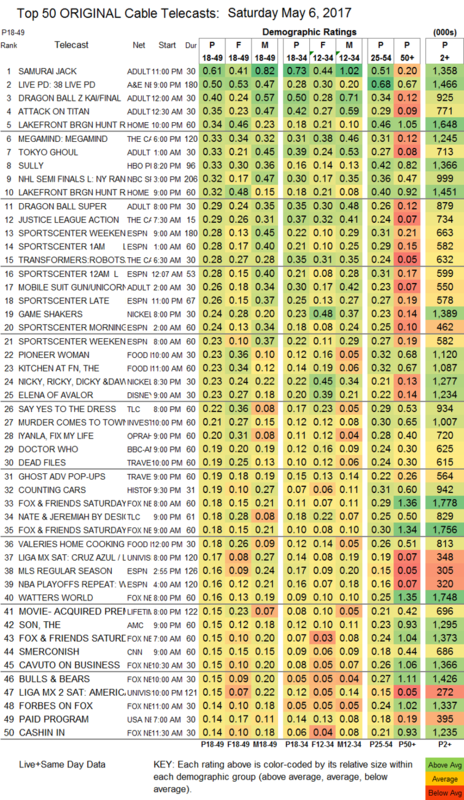 CABLE HIGHLIGHTS: With the night’s sports on the broadcast networks (an afternoon NHL PLAYOFFS game on NBC Sports Net was at 0.32), it was quite a mixed group of shows at the top of Saturday cable. Adult Swim was on top, and their line-up performed as follows: SAMURAI JACK down 0.03 to 0.61, DRAGON BALL Z down 0.08 to 0.40 (the primetime episode was down 0.07 to 0.29), ATTACK ON TITAN down 0.02 to 0.35, TOKYO GHOUL down 0.01 to 0.33, MOBILE SUIT GUNDAM steady at 0.26, HUNTER X HUNTER steady at 0.30/649K, NARUTO down 0.02 to 0.25/539K, and GHOST IN THE SHELL down 0.04 to 0.23/515K. A&E’s LIVE PD ticked down to 0.50. 2 episodes of HGTV’s LAKEFRONT BARGAIN HUNT were in the Top 10 at 0.34/0.32, compared to last week’s 0.34 for a 1-hour episode. 2 networks listed their theatrical movies as “originals,” putting Cartoon Network’s MEGAMIND and HBO’s SULLY in the Top 10, both at 0.33. Cartoon Network also had its 7:30AM JUSTICE LEAGUE (0.29) and 6:30AM TRANSFORMERS (0.28) in the Top 15. On Food Network, PIONEER WOMAN and KITCHEN AT FN each edged up 0.02 to 0.23, with VALERIE’S HOME COOKING down 0.03 to 0.18. TLC’s SAY YES TO THE DRESS ticked up to 0.22, and NATE & JEREMIAH BY DESIGN was up 0.03 to 0.18. OWN’s IYANLA FIX MY LIFE dropped 0.02 to 0.20, and BOOK OF JOHN GRAY stayed at 0.15. . On BBCAmerica, DOCTOR WHO lost 0.02 to 0.19, and CLASS was up 0.01 to 0.07. History’s COUNTING CARS fell 0.07 to 0.19. AMC’s THE SON ticked up to 0.15, and the Sundance simulcast was at 0.01/141K.